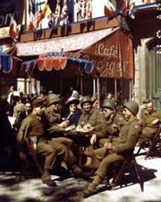 When I was growing up in Berlin, after the war (World War II), we lived in the American sector and the American soldiers were everywhere—on the streets, in the cafes. No one wanted them there, but whenever we made disparaging remarks, our own authorities tell us we must not do this. They tell us the Americans can do what they like and we just have to accept it. So, we stop using the words, “Yankee” and “American.” They are the occupying forces, just like the Romans were at one time, so, amongst ourselves, we refer to them as “the Romans.” So, we talk freely in the cafes about the “Romans” and the American soldiers don’t know that we mean them. The US is unique in the world with regard to occupation. It has been estimated that the US has over 325,000 military personnel in over 1,000 overseas military bases in more than 150 countries, but statistics are widely conflicting. There are those who praise this policy, stating that the US “keeps the world safe for democracy;” however, the US is known (at least to us outsiders) as a country that typically routs elected governments, installs corrupt and ineffectual puppet leaders, and seeks to control the occupied country as a satellite state. Not surprisingly, many Germans, even today, feel that neither the Russians nor the Americans can be trusted, as they are seen as “empire builders” who play out their ambitions in foreign lands. Although today, there is a fair bit of cooperation between the governments of the US and Germany, the German people themselves have, even recently, expressed their distrust by asking that the Bundesbank demand the return of their $141 billion in gold from the US Federal Reserve, and have additionally railed against NSA spies in Germany. Two thousand years ago, the Romans created an empire by training its own people as troops, then invading other countries, stripping them of their wealth. They then left troops behind in each country as occupiers to maintain Roman control. Unfortunately, after the initial pillaging, there was little ongoing wealth to be taken, and the occupations became expensive liabilities. Eventually, the once-wealthy Rome sank into debt and relied more and more on mercenary troops—troops that had no real loyalties to Rome and would eventually turn on Rome, when the money ran out. The US is now in a similar state. There is no more military draft in the US, and the majority of soldiers occupying the 150 countries are mercenaries (or, in today’s nomenclature, “defense contractors”). As the US is technically bankrupt, it is only a question of time before the cheques stop coming. As in Rome, it can be expected that the mercenaries will drop their “loyalty” with little or no warning at some point. The US Government clearly believes in the concept of occupation, as it is actually increasing the number of countries where it has troops in occupation. In addition, in the last decade, the US has been dramatically ramping up its preparedness for war at home. Not since World War II has the US spent so much money building tanks, buying bullets, and training troops to get ready for a major conflict. Billions are being spent on this effort, and of the three downsides to occupation, this is the one that should concern American citizens most greatly, as, for the first time since 1865, the American continent itself is planned to be the occupied territory. Indeed, under the National Defense Authorization Act, passed in 2011, the US was declared a “battlefield,” a legal term that allows a government to suspend habeas corpus and to authorise any authorities to act toward the people of the country as “enemy combatants,” should they suspect for any reason that this might be so. As stated above, Klaus himself later became an air force pilot and an “occupier” of sorts. Still, he is correct in his view that to be the population that is occupied—that is, to be under the control of militaristic rule—is no way to live. It would appear that, in the US, the clock is ticking. “Occupation” may be an inevitability, and we are now seeing the quiet before the storm—the time when each individual may assess his options. One thing is certain: when the DHS troops are deployed, they will not be looked upon as the friendly neighbourhood cops of past generations. They will be seen as the Romans… the occupying forces.